So I guess you have all now realized that the Set In Style exhibit at the Cooper Hewitt has inspired my week!! After seeing the spectacular Van Cleef jewels, I began to wonder what I would do if I had a valuable collection of baubles. Keeping everything in the original boxes is not an elegant solution and although a safe deposit box is, well – safe, it certainly isn’t practical in terms of having things on hand. A home safe is the best of both worlds but they tend to be rather unattractive. So in my search for a more aesthetic version, I came across the ultimate solution. Although a Traum safe might cost you as much as a small house, it is the equivalent of a gorgeous piece of furniture that just happens to have the security of a lock box in Zurich. 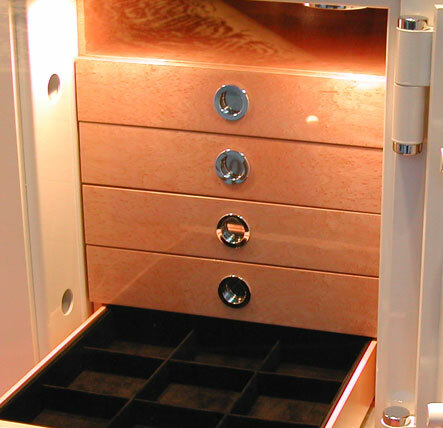 Established in 1990, Traum safes are beautiful enough to stand proudly in a designer closet and are totally customizable. And if you want to have it out in a room, they can design an exterior to match your decor. And I love how there is interior lighting! Where they really shine, however, is in the interior fittings, which they will totally custom fit to your collection. For those with larger collections, there are full size standing versions where you can store large artwork and hang your sable coats. 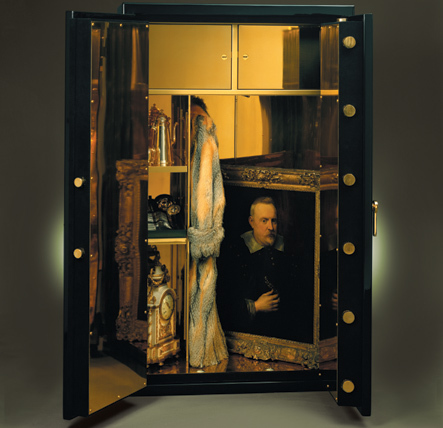 And for those of you who have just won the lottery, and splurged on amassing a REALLY big collection, Traum will be delighted to supply you with a private walk-in vault. There are actually several standard designs or you can custom order one. So if you have paid a visit to Van Cleef, or have a house full of jewels and other valuables that deserve the luxe treatment, Traum could be your answer. This entry posted in furniture, interior design, jewelry. Entry Tags: Traum Safes Bookmark the permalink. 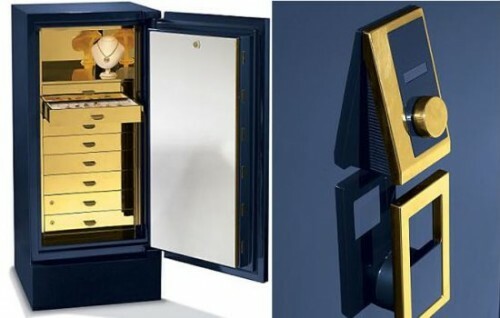 Those safes are as exquisite as the jewels within! Pure luxury. How interesting! Just wish I had jewelry to go with those safes! P.S Thank you for your sweet comment about my sadness re: the broken plaque…. Ooops, I am losing brain cells! It was another blog friend with a Q in the name that commented on the plaque!!! Thank you for your comment about the Ilse Jacobsen boots! Crossing fingers and toes for you! These jewelry “Boxes” are as beautiful to me as the jewels they hold. Great post. My, can you imagine having the life where you would need a safe like that? Thanks for letting us all dream a bit! Beautiful safes but I only wish I had jewels to go in them! Marvelous post. I have one of the ugly 5 ft. safe that is built into a cabinet in our laundry room. When we did our pre-closing inspection on the home, the home-owner was proud to show me the bad-boy safe & warned me to “lock up my jewelry”. I didn’t dare tell her it was wasted on me, I’d need some valuable jewelry first! 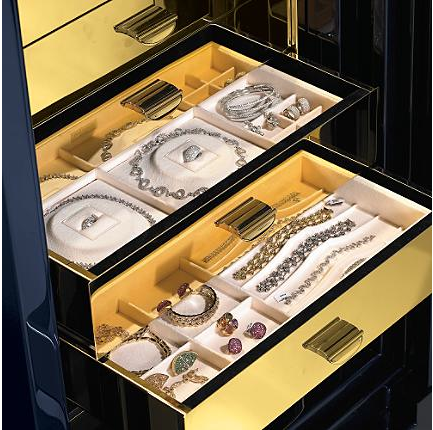 needful things….would love the walk in vault for no other reason than the feeling of pure luxury…well, and I guess to hold all of my diamonds….. I have a safety deposit box at the bank that’s filled not with jewelry, but with daguerreotypes! Why would I do that? Because the bank vault is at a constant temperature. I wonder if Van Cleef does temperature control? You’re not kidding here, huh? :-) Beautiful! It’s true, having a safe at home is much more practical than at the bank! I lost the combination to our home depot safe about 10 years ago. My jewels are safely inside. Wow, reminds me of the movie Princess Diaries! 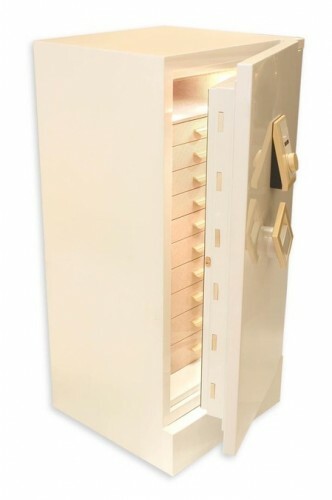 Can you imagine having a collection large enough for one of this gorgeous safes? I would wear them with everything. I know that you have enjoyed the week. Lucky you. Wow, reminds me of the movie Princess Diaries! 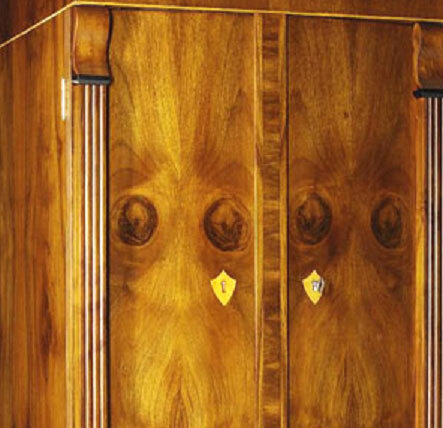 Can you imagine having a collection large enough for one of these gorgeous safes? I would wear them with everything. Nice bauble storage! Would love to have the need for one, meanwhile I just use an old Korean chest of drawers for mine. 82 queries in 0.541 seconds.